Understanding pathogen spread in wildlife has important implications for conservation and management efforts. This is particularly the case for taxa that are susceptible to disease spillover events resulting in outbreaks and rapid population declines, such as carnivores. However, assessment of the spatial structure of pathogen exposure (pathogen spatial autocorrelation) is relatively rare for these kinds of taxa. Structure in pathogen exposure may reflect a number of important features, including host traits, pathogen traits, and detection methods utilized. The relatively wide-ranging nature of many carnivores may lead to rapid pathogen spread and obfuscate any spatial autocorrelation being detectable, but this has not yet been explicitly evaluated. Here, we tested for evidence of spatial structuring of pathogen exposure and coexposures for puma (Puma concolor) and bobcat (Lynx rufus), both mobile and wide-ranging felid species. The study included 440 puma and 639 bobcat from six study regions (one in Florida, two in Colorado, and three in California), as well as each animal's capture location and exposure status for up to eight pathogens. This allowed a thorough examination of spatial patterns of pathogen exposure across different pathogen transmission types, different habitats, and different host ecology. We tested for spatial autocorrelation for each pathogen in each host species at each site, as well as both host species combined. In addition, we tested for coexposure between all pathogens in the study, and for those pathogens that were correlated, we tested for spatial clusters of coexposure. We detected spatial autocorrelation in exposure status for approximately 2% and 10% of examined cases for puma and bobcats, respectively, and spatial clustering in approximately 17% of cases where pathogen coexposures were detected. 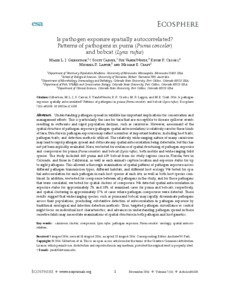 These results suggest that wide-ranging species, such as puma and bobcat, may rapidly disseminate pathogens across their populations, precluding substantive detection of autocorrelation in pathogen exposure by traditional serological and infection detection methods. Thus, targeted pathogen surveillance or control might focus on individual host characteristics, and advances in understanding pathogen spread in these secretive felids may necessitate examinations of spatial structure in both pathogen and host genetics.